I already pointed out, in my coverage of the July 29 public hearing on Atlantic Yards held by the Empire State Development Corporation, that some people testifying on behalf of ACORN had no clue about the actual terms of the affordable housing agreement. The written testimony, as I describe below, was equally uninformed. In other words, ACORN members express sincere and deeply-felt needs, but those needs can't be met by Atlantic Yards, even if it were built at the promised timetable, which is highly unlikely. During the hearing, one ACORN member, George Finley said that the deal with “Forest Ratner” made housing, including private houses, available to those earning $20,000 or less. As the housing chart below shows, very few households earning $20,000 a year would be eligible, and none for private houses. This kind of misinformation misleads ACORN members and the public. In fact, it's a reminder that, just as the recent subprime crisis involved irresponsible lenders and irresponsible borrowers, the Atlantic Yards affordable housing deal involves obfuscatory and irresponsible sponsors and supporters. At the July 29 public hearing, ACORN CEO and Chief Organizer Bertha Lewis, in her aggressively theatrical style (at 1:30 of the video above), "And if you quote something, tell the truth and have the facts." Further, written testimony from the hearing record shows that ACORN members contradicted the words of their leaders. 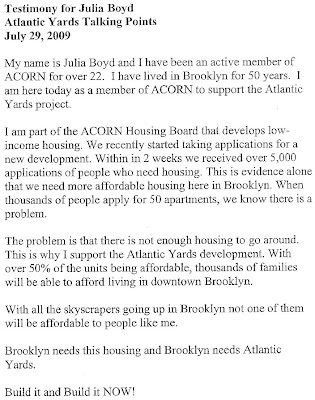 I am part of the ACORN Housing Board that develops low-income housing. We recently started taking applications for a new development. Within in 2 weeks we received over 5,000 applications of people who need housing. This is evidence alone that we need more affordable housing here in Brooklyn. When thousands of people apply for 50 apartments, we know there is a problem. The problem is that there is not enough housing to go around. This is why I support the Atlantic Yards development. With over 50% of the units being affordable, thousands of families will be able to afford living in downtown Brooklyn. The 5000 applicants Boyd cites need not simply the 2250 subsidized "affordable" units that would be part of Atlantic Yards but rather than 900 low-income units. And, given 2250 market-rate units and 1930 condos, only about 35% of the AY apartments would be affordable, not 50%. And whether those units are built over a decade, as officially promised, or 25 years, as seems more likely, there's no way the demand Boyd mentioned would be met. I am the Tenant Association President of Parkview Apartments in Flatbush. Our landlord is trying to convert our building from Section 8 to market rate. How are people going to be able to afford Market Rates. The people in my building cannot afford $2,000/month rent. Where are people going to go? There is no housing left in Brooklyn, let along any housing that is affordable. That is why we need to Build Atlantic Yards and BUILD IT NOW! While ACORN members clearly want low-income housing, the subsidized housing deal signed by ACORN would not help them as much as they think. 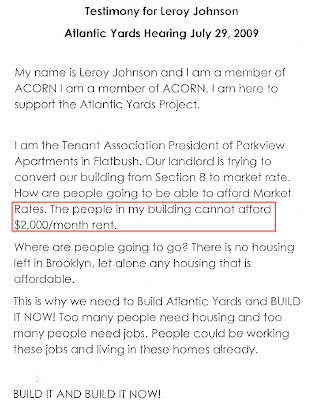 Perhaps that's why ACORN's Lewis very carefully testified that 50% of the units would be "affordable to the Brooklyn residents who need more housing: low, moderate and middle income families." 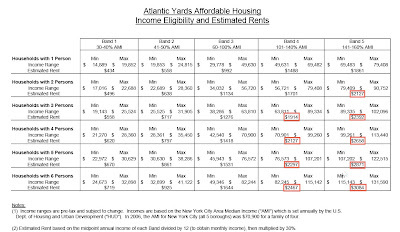 As the housing chart prepared by Forest City Ratner in 2006 shows, even then, before the Area Median Income (AMI) went up and thus increased rents, the 900 middle-income housing units were not affordable to typical ACORN members, as rents would be near or over $2000 for a family of three. Indeed, at the July 2006 affordable housing information session sponsored by ACORN and Forest City Ratner, many people attending expressed dismay that a significant slice of subsidized units would be unaffordable to them. Indeed, a good slice would be well above market rates. Maybe that's why Forest City Ratner's MaryAnne Gilmartin, answering questions in July, strenuously avoided explaining the actual projected monthly rents. Indeed, given the recent rise in AMI, those rents would be even higher, as Michael D.D. White explained this spring. For example, a four-person household in the second most expensive "band" in 2006 would pay $2127 a month. Now it would be $2304. Cost-benefit analysis on housing subsidy? The "Build it and Build it NOW!" mantra repeated by Boyd, Johnson, and so many other project supporters should be met by a question that's been asked several times by project critics and opponents. Has the ESDC conducted a cost benefit analysis of the needed subsidy to build the affordable housing component of this plan compared to the subsidy needed to build the same number of units at other locations? In the Response to Comments document prepared by the ESDC, the one summary comment about affordable housing ignored that question. Comment 21: Numerous comments asserted that the MGPP would include fewer affordable housing units, that Phase I would not introduce a substantial number of affordable units, and the affordable housing will not be affordable to anyone who is making less than the Brooklyn median income. Response: The number of affordable housing units to be developed by the Project has not changed; the MGPP, like the GPP, requires that 2,250 units of affordable housing be created under the full build-out. The profile of affordable housing in terms of income eligibility also has not changed. As with the Project approved in 2006, the income bands continue to be based on the Mixed-Income Program administered by the New York City Housing Development Corporation. The GPP has always specified that 30 percent of the residential units on the Arena block be affordable housing. The only change in the MGPP with respect to affordable housing units would now require no less than 300 affordable housing units to be constructed on the Arena block. Similarly, the ESDC punted on whether housing subsidies would be available. Response: The MGPP does not include any modifications that would affect the availability of financing for the Project’s affordable housing. Comment 14: A number of comments raised concerns that the public benefits of the Project, such as the affordable housing and jobs, are not legally binding. Response: The MGPP has not changed the requirement for 2,250 units of affordable housing upon completion of the Project. Project documentation (e.g., the development agreement, lease agreements, and related contractual documents) will reflect the commitment made in the MGPP. As I wrote, that commitment depends on subsidies. Given the political juice behind Atlantic Yards, and the hope by some elected officials that, if something gets built, affordable housing comes first, it's not unlikely that scarce housing subsidies would be directed at Atlantic Yards, no matter whether the subsidy is greater than at other locations.